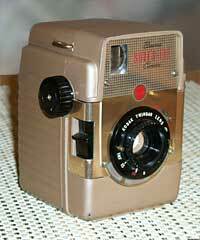 This is the newest addition to my camera collection - a golden Kodak Brownie Bull's-Eye camera from the late 1950s. As you can see, the camera is in great condition. The camera originally worked with the obsolete 620 film format, but it is possible to load modern 120 film without too many problems. Here are two examples taken with Agfa black and white film and with Agfa color film. The Bull's-Eye negatives are 6 by 9 cm large - slightly too big to scan in my Epson scanner which has maybe a 5.5 cm wide area where negatives can be scanned! Here are two examples of pictures I've taken with this camera - click on the images for a larger version.